All photos courtesy HDR Inc.
April 13th of this year marked the one-year anniversary of revenue service for the Dallas Streetcar — the first modern streetcar in Dallas and the first in the U.S. to operate off-wire with an on-board energy system for nearly a mile. The 1.6-mile starter line, from downtown’s Union Station to Oak Cliff’s Methodist Medical Center, traverses the Trinity River corridor, which separates southern Dallas from the city’s largest employment centers. The project targeted commuters in mixed-use districts adjacent to downtown and helped connect them to transportation choices available in the city center. 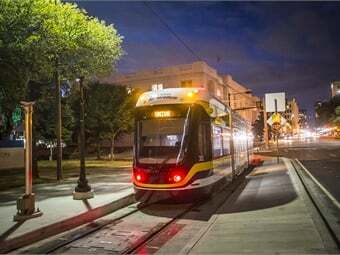 Using hybrid technology, the streetcar returned an iconic mode of transit to the aging borough of Oak Cliff, southwest of downtown Dallas, which is a historically low-income area cut off from the city by the Trinity River and its sprawling floodplain. Since the streetcar’s implementation, as well as an adjacent shared-use pathway, Oak Cliff residents now have multiple transportation options. Funding for the $56.6 million project came from Dallas Area Rapid Transit (DART), the City of Dallas, the North Central Texas Council of Governments, Texas Department of Transportation and the FTA. Project development was kick-started by a $26 million federal TIGER grant. The unique project involved rehabilitation of a 100-year-old Houston Street Viaduct — a historical landmark, which connects Dallas with the Oak Cliff section of the city. • Put streetcars where pedestrians will be. • Connect maximum number of existing destinations. • Fit into street network. • Follow an easily understood route. • Conduct preliminary utility investigation. • Access development and funding/financing opportunities. • Consider a starter line that is affordable and manageable. • Address issues affecting feasibility/cost. • Develop a reliable cost estimate. • Identify sites for substations and MSF. • Detailed survey of utilities. • Engage the public/businesses directly and early. • Lock the alignments as soon as possible. • Utility relocation (typically four to eight weeks per 600 to 800 feet). • Place track/civil/foundations (typically three to four weeks per 600 to 800 feet). • Install OCS/traffic signals/punch list (schedule varies). • Testing/Start-up (general four to six months). DART bus service is available near all of the streetcar lines’ four stops, with two more stops being added in late August, says Morgan Lyons, assistant VP, external relations, for the agency. At the Union Station stop, the northern terminus, customers have access to light rail (DART Rail) and to Fort Worth via the Trinity Railway Express commuter rail system. In response to customer demand, DART recently expanded streetcar service to evenings, late nights and weekends, Lyons says. Additionally, there are two extensions in the works being designed by HDR — the lead designer for the first phase of the Stacy and Witbeck/Carcon Industries’ design-build of the first Dallas Streetcar phase. The second phase, which consists of approximately 0.7 miles of double track, extends the line to the shopping and dining of Oak Cliff’s Bishop Arts District and is expected to be completed late August 2016, according to Lyons. The third segment, currently in planning, will expand the streetcar line to the Kay Bailey Hutchison Convention Center and the Omni Dallas Hotel, he adds. 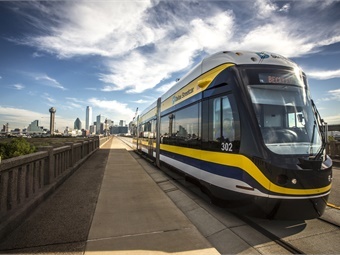 Additionally, the Dallas Streetcar was singled out from a field of more than 360 projects from 66 countries to receive the Special Recognition Award for Advancing Integrated Projects, one of top five Be Inspired awards from global software company, Bentley. The HDR design team refined the original alignment, lowering costs, improving safety and minimizing the project’s footprint, according to the company. The system, featuring Liberty Streetcars manufactured by Brookville Equipment Corp., leverages both an overhead contact system (OCS) with wayside infrastructure and an onboard energy storage system (OESS) to cross the Houston Street Viaduct without dependency on overhead wire. The 66.5-foot-long and eight-foot-wide streetcar traverses this bridge over and back for two miles of off-wire operation. The OESS is comprised of lithium-ion batteries and a battery management system, which ensures successful off-wire runs. While connected to the OCS, the OESS recharges to replenish power availability. In addition to providing propulsion for the vehicle, the OESS also powers all auxiliary systems, including HVAC and lighting, according to Adam Mohney, Brookville Equipment’s marketing specialist. “[The hybrid system] is significant because it allows cities like Dallas to overcome existing infrastructure challenges and maintain aesthetics for significant portions of their streetcar routes,” Mohney says. Streetcars can clear overpasses with limited clearance heights, cross bridges where wayside infrastructure may be challenging to install, preserve aesthetics of historical districts and generally reduce the amount of needed wayside electrical infrastructure, he adds. In response to customer demand, DART recently expanded its Dallas Streetcar service to evenings, late nights and weekends. In addition to the off-wire capabilities, the Liberty Streetcar is articulated and features three-car sections. The streetcar is 70% low floor and the car features 100% platform-level boarding, ensured through the use of an under floor-mounted hydraulic-leveling system. The on-board energy storage system OESS trays are also mounted below both operators’ compartments and stored in slide-out trays for easy maintenance access and cell replacement, creating a dependable, redundant system, Mohney says. • Who will develop and/or operate the system? • How will the project be financed/funded? • What factors should be considered when planning the corridor? What about design? • Are there environmental requirements that must be met? • How do we deal with construction impacts in an urban environment? The streetcars, which meet all necessary standards and guidelines, including ASME RT-1, APTA, AAR, FRA and ADA, according to Mohney, are designed and manufactured at Brookville’s Pennsylvania-based facility. Other projects that will utilize Brookville Equipment’s OCS and OESS vehicle technology include Detroit’s 3.3-mile Woodward Avenue line, for which it will begin supplying six off-wire capable Liberty Modern Streetcars in the fourth quarter of 2016. The company also recently finalized a $25 million contract to supply streetcars to the City of Oklahoma’s MAPS 3 Modern Streetcar program, which will operate downtown along a two-mile east-west loop and a 4.9-mile north-south loop.